Simplify and speed up your staffing process with Zoho Workerly's effective temp staffing software. Experience conflict-free scheduling, stress-free time-sheet management and hassle-free invoice generation. Build your network of countless happy clients. Up the Tempo of your Temp Jobs with our Employee Scheduling Software. 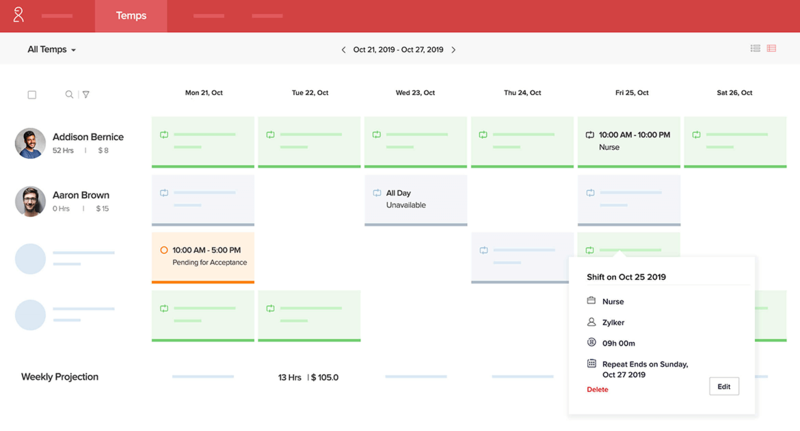 Zoho Workerly enables agencies to manage contract/temp workers, assign them to jobs that fit their skill set, while maintaining their time sheets and billing. Organize all your temps, jobs, and clients while grouping them into personalized dashboards. Let data guide you as you assess openings and place temps. Faster. Daily. Say goodbye to manual searches. Get a list of matching temps for a job with Criteria Search, so that you can schedule or reschedule jobs quickly. Keep them updated, every time. Communicate better with your temps and clients with effective communication channels. Keep every party informed about any change instantly. Build Timesheets as you need them. Daily, weekly or monthly. Break down and build time sheets that fulfil your unique requirements, fixed along set billing timelines. Send invoices to clients with the built-in Zoho Books integration. Maintaining regular e-timesheets helps you manage payments to temps up to date. Payroll Exports Generate and export your payroll report directly to your payroll provider. Your work, in your palm. 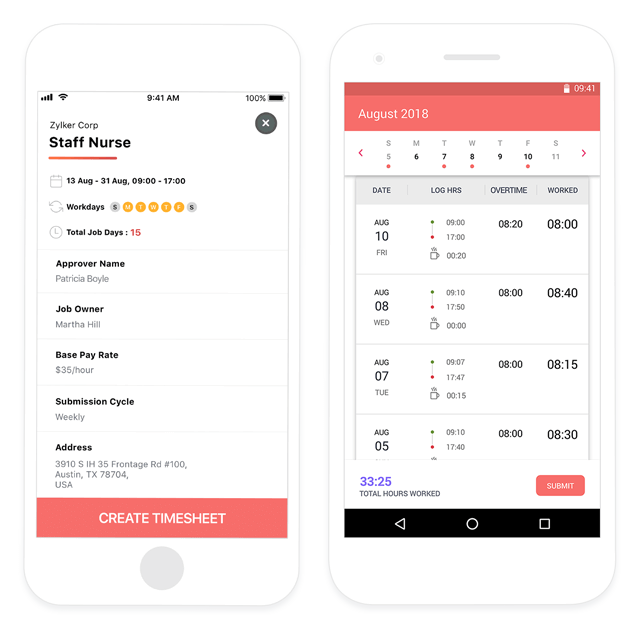 Empower your temp workers with our Workerly mobile application. Enable temps to accept jobs, create digital timesheets, clock in their time -- all right from their mobile devices. Manual time logs are now history. Switch to digital records and maintain an organized database of all your temps and their work hours. Get all your agents on board. No more investing on agent-specific licences. Our pricing has been designed to allow your team to get free and complete access to the software. No more delays in processing invoice for temps as Zoho Workerly comes with a default integration with Zoho Books. Upon enabling the Temp Acceptance in Zoho Workerly, you can enable your bunch of talented temps to accept or reject jobs assigned to them. A Permanent Solution for Temporary Staffing.